I love ramen. Ever since declaring Ippudo the Best Of Show in New York City, I’ve been looking for worthy runners up. (So far, #2 in my opinion is the standard ramen at Bassanova, but that’s another story for another time). 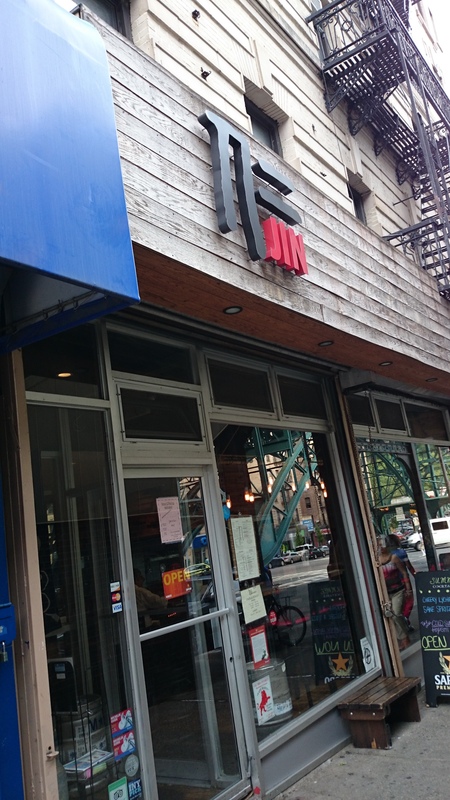 Jin Ramen, a hop, skip and a jump away on the uptown 1 train, has been one I’ve been hearing about, both from friends as well as the standard NYC food blogs (as well as some not-so-standard blogs). I decided to check it out. At best average. Not worth the trek or the $12. The storefront has friendly exterior decor, and they have a sister restaurant, Kissaten, next door. When you walk in, you’re greeted with calls of irrasshaimase, though you won’t get a shout from every in the restaurant as you might at Ippudo. I sat down and ordered the tonkotsu ramen. This is usually the standard I go by when checking out a new ramen place as a baseline. It arrived quickly. Aesthetically, pretty standard. I took a bite, and … was disappointed. It wasn’t bad, but it wasn’t as great as I had hoped. The bar had been set too high! 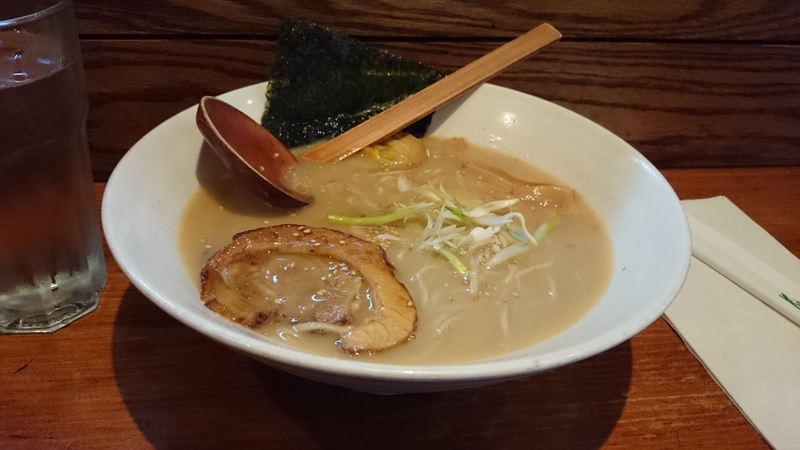 The broth did not have that fatty richness that I have come accustomed to expecting from a tonkotsu. The noodles had an aroma that exhibited all the complexities of … salt, with a standard fare texture. Just to be sure, I ordered the kaedama (extra noodles), and, while a bit more al dente because the broth had cooled somewhat and could not cook the noodles anymore, tasted the same. The pork was good, but not great, and one of the better parts of the composition, as everything else was average at best. I’m not going to ever turn down a boiled egg in my noodle soup, but it just wasn’t standout, whereas the nitamago at Ippudo always, always give my taste buds a party. At the end of it, the bill was $15 and change. Not expensive, but, and I’m sure this is my living in New York City breaking my sense of what things should cost, not a good deal. I didn’t break the bank, but I did spend $15 on an average meal when I could have spent that money, time and empty stomach on something truly delicious instead. Ikai Lan is an occasional guest author for The Culture Bite. Though he loves both to eat as well as write, he finds that writing a real post takes a larger block of time than he is generally able to free up. He resides in New York City, though he’s been known to surface here and there on a whim. 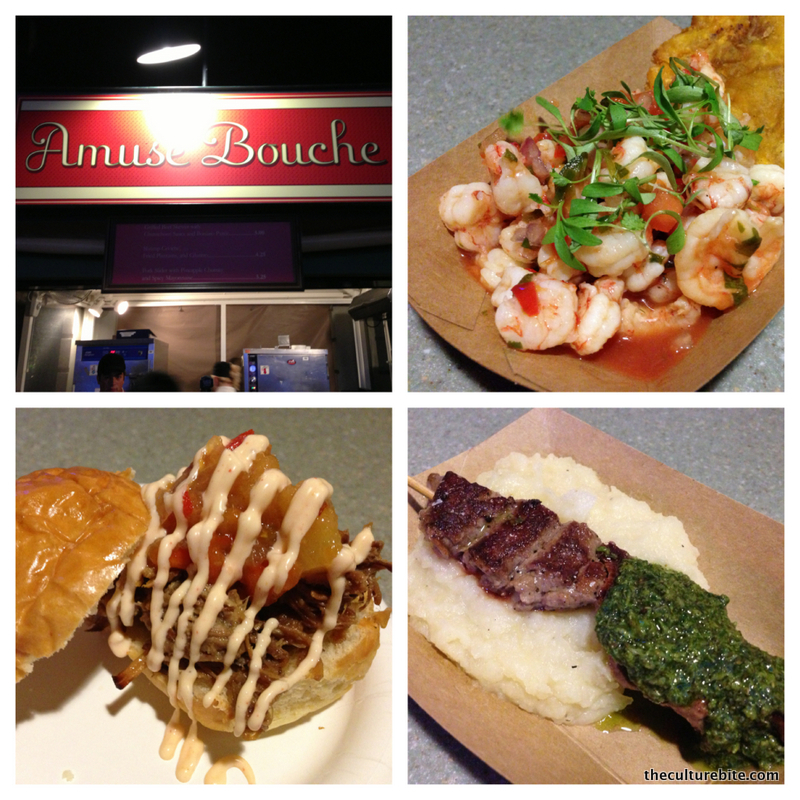 On our first night in Orlando, K and I headed for Downtown Disney to try out the Food and Wine Festival Kiosks–Amuse Bouche and Cheese and Sweets. 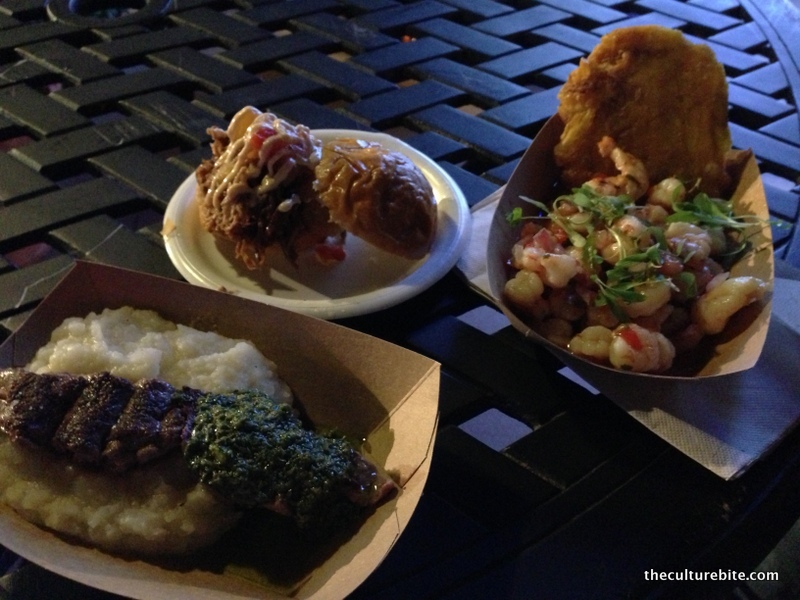 Disney World took the 2 most popular stands from the 2012 Epcot Food and Wine Festival and made them regulars in Downtown Disney. Of all the food we consumed during our trip, Amuse Bouche was by far the best. I only wished Downtown Disney was more convenient so we could eat here more often! The food was so tasty and affordable! K and I ordered one of each for $13. The favorite of the bunch was the grilled beef skewer–flavorful, tender and light. We only ordered the cheese fondue at this stand. It was delish, but there wasn’t enough bread. K and I ended up having to drink the leftover cheese, but hey, we’re not complaining. On my next trip to Orlando, I’m definitely planning around this festival because this was just a taste and I want more! 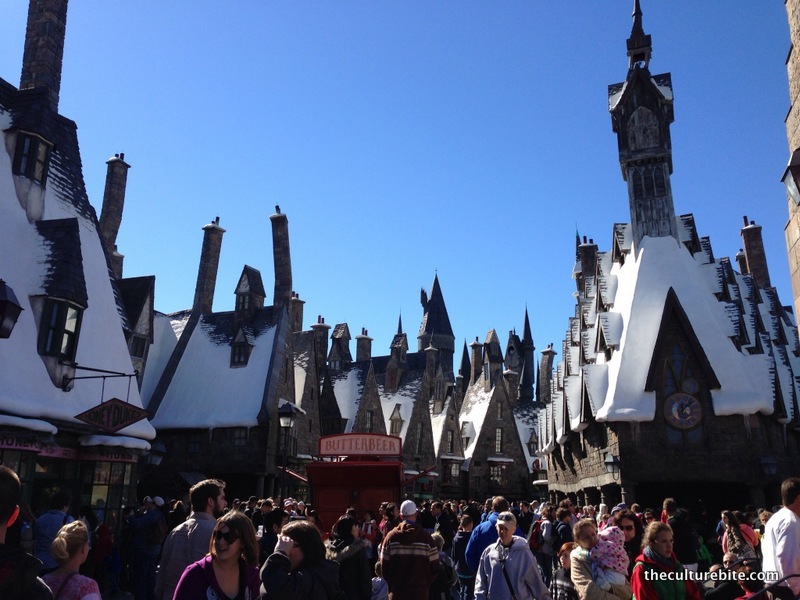 If you’re planning a trip out to Orlando, The Wizarding World of Harry Potter at Universal’s Islands of Adventure is a must. I am a huge Disney fan, but I will admit that Harry Potter world is the most impressive theme park I’ve ever seen. The detail put into this park is exactly how it’s described in the book–from the food to Moaning Myrtle’s voice in the bathroom to Hogwarts itself. The town is based off of Hogsmead which is a town described in book 3, Prisoner of Azkaban. The town houses familiar shops such as the Three Broomsticks, Honeydukes, Olivander’s and Zonko’s Joke Shop. The facade of the town looks unreal, like someone pulled you out of Orlando, Florida and into a Harry Potter movie. In the distance, you can see Hogwarts almost like a backdrop, but really, it contains the most innovative ride I’ve ever been on. Unfortunately, there are no free fastpasses at Universal so be prepared to wait in lines. 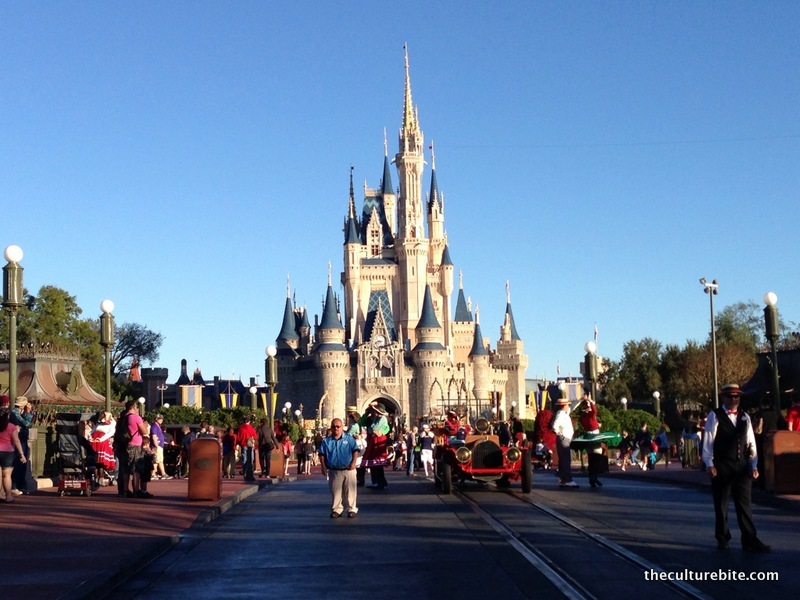 The Express passes are $30+ and may actually be worth the extra cost to cut lines. 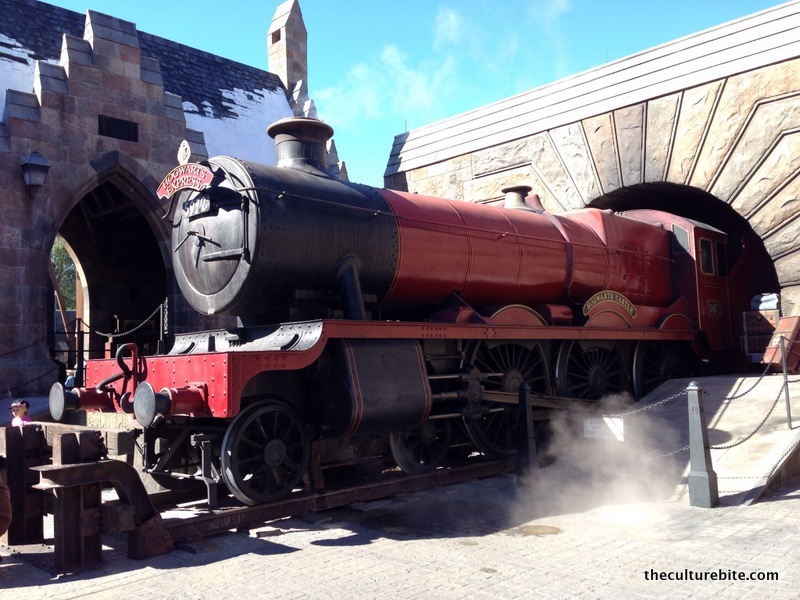 Quick tip: Harry Potter World is busiest in the morning. If you want to avoid lines and crowds, come back in the evening when most families made their way to Universal’s other park. 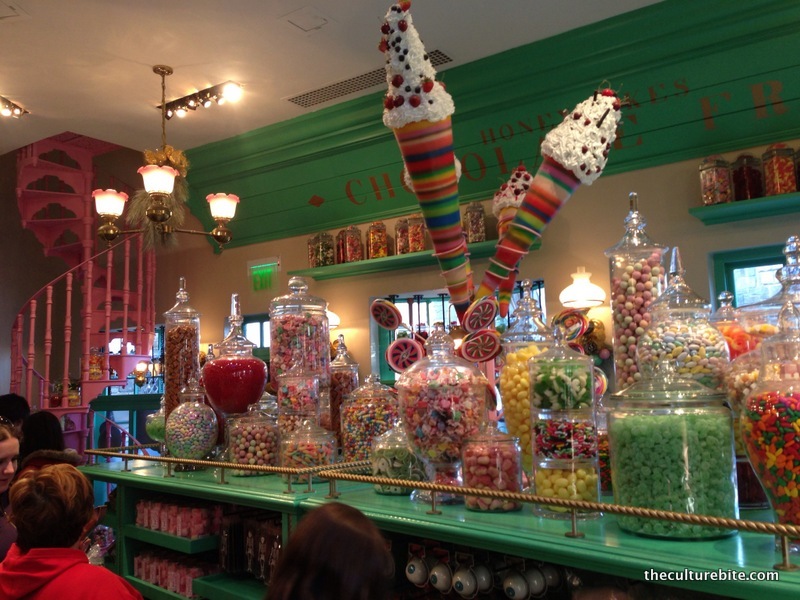 Honeydukes – I easily spent $40 here buying chocolate frogs, Bertie Botts Every Flavor Beans, chocolate wands and candy floss. Zonko’s Joke Shop – This is a fun place for souvenirs like a Sneakoscope or Extendible Ears. Olivander’s – K and I found a line outside Olivander’s and decided to hop in without knowing what it was for. After about 30 minutes, we were taken into Olivander’s wand shop for an experience. Olivander chose 1 lucky person from the group (me) and had me test out 3 wands similar to what Harry did in book 1. I killed a pot of tulips and rattled a bunch of shelves before I finally found my match. For a price of $30, I could have purchased that wand as a keepsake, but decided to pass. 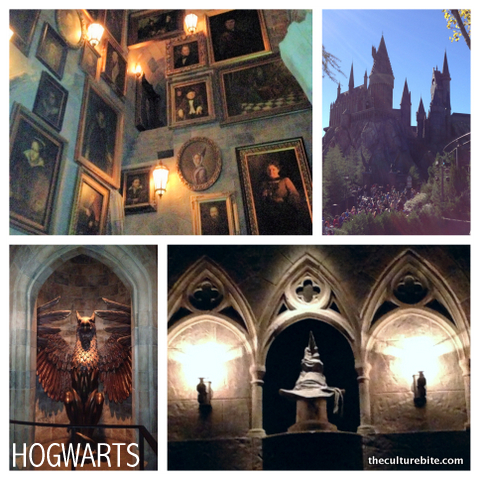 Hogwarts – The school not only houses the most amazing ride ever, it’s also a tour. While waiting in a ridiculously long line, you’re able to meet your favorite characters–Harry, Ron and Hermione–in the library, see the sorting hat and walk through a corridor of talking portraits. Filtch’s Emporium of Confiscated Goods – Come here to purchase your favorite Harry Potter scarf or cape. Harry Potter and the Forbidden Journey – I’ll admit that I was extremely nervous waiting in line through Hogwarts for this ride. I had no clue what to expect. Fast speed? Big drops? The answer is neither. To my surprise, it easily became the best ride I’ve ever been on. I don’t want to give all the secrets away, but I’ll describe it as a mixture of a Disney Fantasyland ride and Soarin’ Over California. I loved it so much, K and I found ourselves on this ride 5 times! In order to enjoy the experience, you have to store your things in one of their free lockers. This part of the wait is pretty disorganized, so store your things quickly and continue on throughout the mansion. Dragon Challenge – This light-weight roller coaster offers 2 different experiences which are weaved together. When waiting in line, you get to choose which dragon you want to ride. 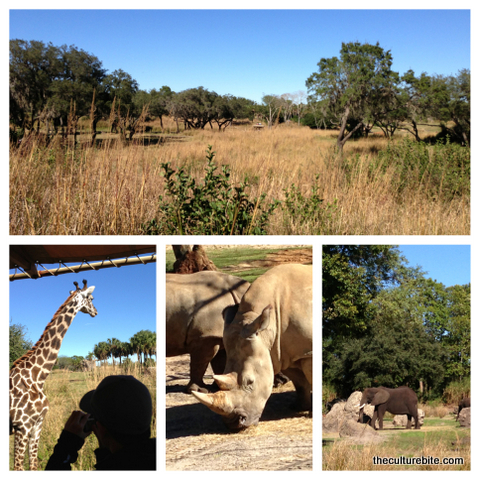 Flight of the Hippogriff – K and I skipped this family-friendly roller coaster. The Amazing Adventure of Spiderman – There are other things to do/see outside of Harry Potter World within Islands of Adventure. This award-winning ride is also a must. It’s similar to the Forbidden Journey ride without the twists and turns. The Incredible Hulk – This is by far the scariest-looking ride I’ve seen at a theme park. Luckily, K didn’t force me to join him. On to my favorite part about this park, the food! Pasties, butterbeer, pumpkin fizz. It’s all here. 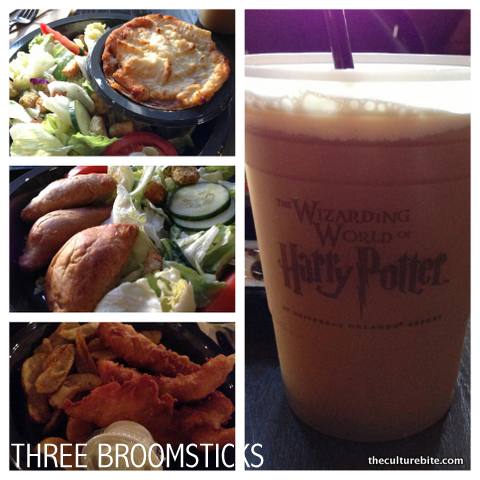 Three Broomsticks – They don’t have the Hogwarts dining hall in the park, but this is the 2nd best thing to it. This restaurant serves meat pasties, shepherds pie, fish n’ chips and giant roasted turkey legs. K and I actually had lunch AND dinner here since it’s the only real restaurant in Harry Potter world. We tried the pasties, shepherds pie, BBQ plate and fish n’ chips. My favorite of all 4 was the shepherds pie, flavorful ground beef topped with whipped mashed potatoes and a bechamel sauce. 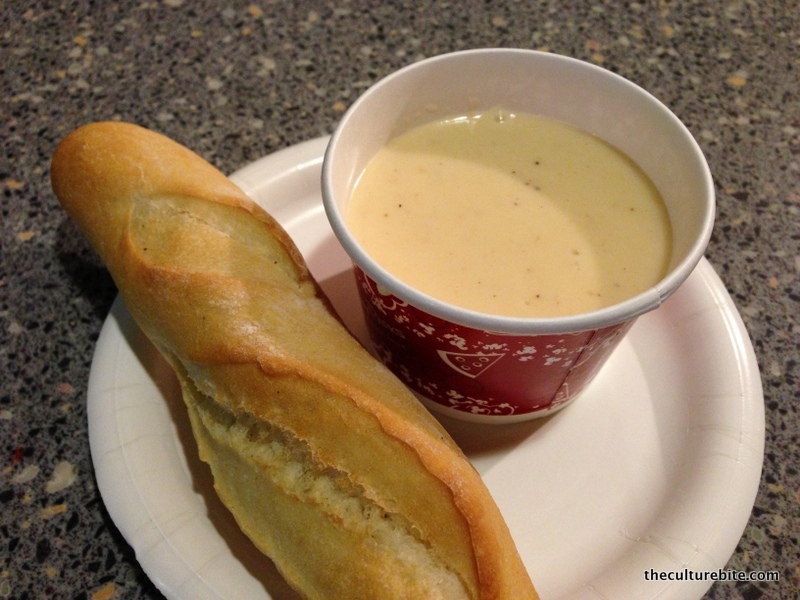 Here is also where you can order a cup of FROZEN BUTTERBEER! This drink is the most amazing invention, frozen cream soda with a hint of butterscotch. Don’t get the cold butterbeer, get the frozen version. We also tried the pumpkin fizz, but butterbeer is a thousand times better. Quick tip: Keep your eyes out for the shadows of elves working in the restaurant. 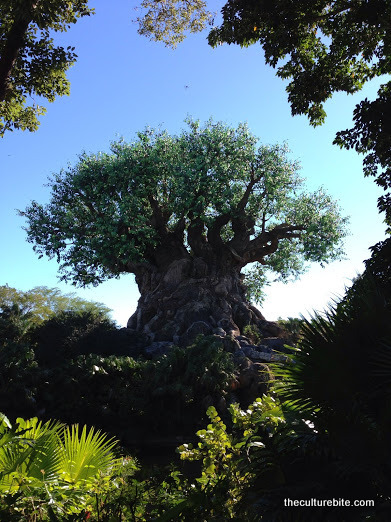 Hope you enjoyed my very thorough recap of Universal’s Islands of Adventure!